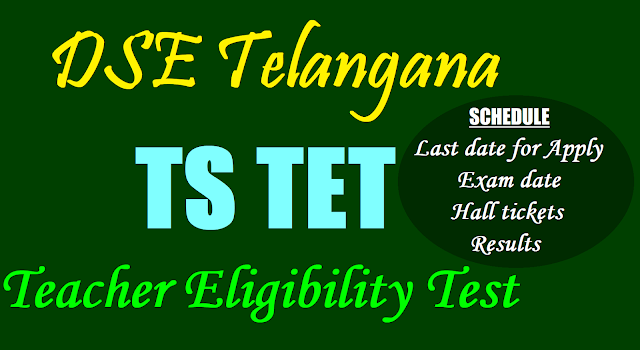 Get the complete details like TSTET 2019 Online Application Form, How to apply for TS-TET 2019, TSTET 2019 Paper-I & Paper-II Exam Scheme(Pattern), Syllabus and Content, TSTET 2019 Exam Date, Last date for Apply Online, Telangana State TET 2019 Eligibility Criteria for SGT, SA & Language Pandit/LP posts, TET Memo/Certificate Validity, Weightage for TET Scores in DSC 2019/ TRT about TS TET 2019 provided for you. Use the given links..
Fresh round of TET notification was necessitated following NCTE directions to conduct the test twice a year to accommodate more aspirants for teachers posts. There is a lot to cheer about for aspirants seeking to land teaching jobs in the State. The State government has decided to conduct another round of Teachers Eligibility Test (TET) on .... for which the notification will be issued on June 10. The State government had already sanctioned 8,792 teachers posts last month and had also directed the Telangana State Public Service Commission (TSPSC) to fill the vacancies. However, fresh qualifiers from B.Ed and D.Ed requested the government to conduct TET which was taken into consideration. The State government wanted no legal tangle over the process of recruitment of 8,792 teacher posts and decided to go as per the NCERT directions to conduct two TETs a year. Nearly 26,100 fresh B.Ed and D.Ed students besides over one lakh without TET clearance stand to gain with the second round of TET. With another TET being held, there is no scope for anyone to knock on court doors since it will pave the way for smooth recruitment of teachers, adding that the government had also consulted the Advocate General and TSPSC chairman before taking the decision. District Selection Committee (DSC) notification for recruitment of posts will be issued by TSPSC within a week after the TET results are announced on August 5. 27,000 teacher posts will be filled in two years. TS TET: The TET examination was last conducted in May, 2016. “In the last one year, around 26,100 candidates have completed either B Ed or D Ed. If the government recruited teachers without conducting TET, those qualified in the last one year may approach the court. so, the state is conducting the TET now,” he said. Those who qualified in the TET earlier could also take the examination for improvement of their rank, he added. 1. Payment of Fees at TS Online or Payment Gateway: ..
2. Download of TSTET Information Bulletin: ..
3. Online submission of application through http://tstet.cgg.gov.in: ..
4. Help Desk services on all working days: ..
5. Receiving of Complaints pertaining to Online applications:. 6. Downloading of Hall Tickets: ..
7. Date of Examination: ..
8. Declaration of TS TET Results: ..
Is it confirm of will be postpone.